Along with the First Christensen Family Olympics, we made pizza from scratch — had to make sure our athletes were well fed, didn’t we? Since Tomas is the Bread King (aka Tomas The Great), I asked him to prepare the dough in advance. 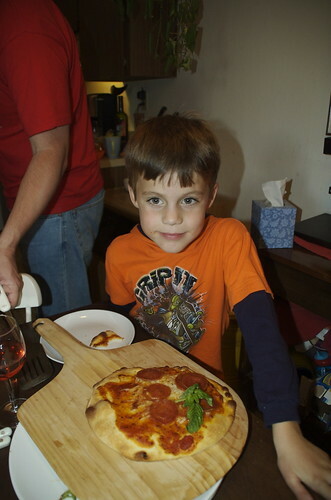 He used Wolfgang Puck’s recipe from the Food Network site, doubling the recipe since we’d be feeding two families. We discovered too late that we only had one package of active dry yeast, but the recipe still worked out (we were prepared to run to the market if it didn’t activate properly). Creme fraiche with smoked salmon and capers. (Only the dough goes in the oven, brushed lightly with a good olive oil). Sun-dried tomato pesto, with prosciutto, and goat cheese. Two days later I’m still stuffed and savoring the memory — I’m such a glutton!